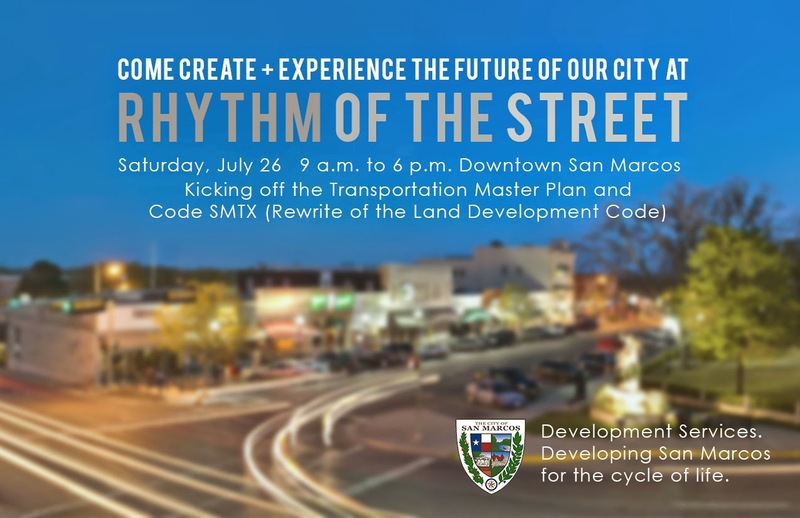 A downtown block will be transformed into a vibrant, walkable and bikeable pop-up space to play, dine and shop as the City of San Marcos Development Services and CIP Engineering departments present “Rhythm of the Street” on Saturday, July 26, 9 a.m. to 6 p.m. on South LBJ Drive. The event is a one-day, temporary installation of concepts, amenities and activities that demonstrate how a block can be better utilized to suit the needs of the community. A pop-up park will add beauty and interest to an otherwise neglected parking lot, while live music and yard games invite the public to stay and enjoy the space. Pop-up shops and an art gallery will temporarily fill vacant spaces to demonstrate retail potential of downtown buildings. The event will also feature concepts that would make the area more pedestrian and bike friendly such as bike lanes, café seating, lighting and landscaping. 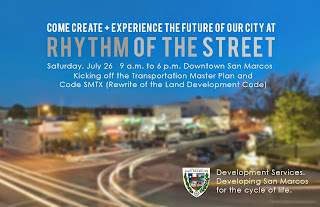 Rhythm of the Street is a kick-off event for the city’s Code SMTX land development code rewrite and the Transportation Master Plan implementation. At the event, citizens are invited to share their thoughts on how to make their community a better place to live. Event organizers are seeking community involvement and are taking requests for activities. A volunteer roundup also will be held at 5 p.m. Wednesday, June 25, on the first floor of the historic Hays County Courthouse. To volunteer or give suggestions for the event, call (512) 393-8430 or email [email protected].